During the May mini semester, graduate students earn three hours of credit for EDP5393 Cultural Issues with Children and Families. The class takes place on the sourthern Osa Peninsula region in the Corcovado tropical rain forest and in the Central Valley (San Jose). In both regions students are exposed to contrasts in culture, school, social services and economic conditions. 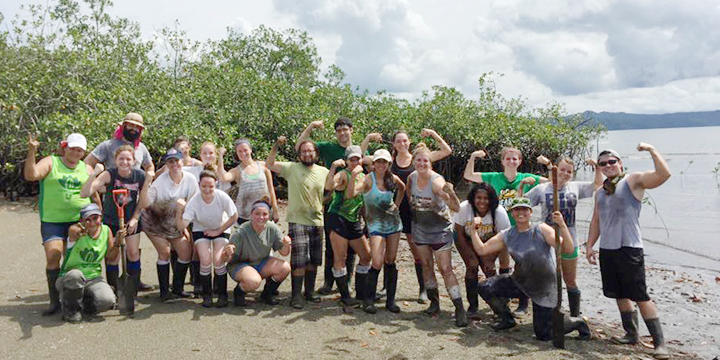 Students interact with school children and teachers and conduct research alongside faculty and Costa Rican graduate students. Site-seeing opportunities include zip lining, kayaking and hiking in the forests. All graduate programs in Educational Psychology require EDP5393 Cultural Issues with Children and Families. This course is regularly offered on-campus during the summer term; however, we offer one of the few study abroad opportunities for graduate students in this two-week mini semester that takes place during the last two weeks of May each year. This mini semester course begins in the southern region of Costa Rica on the Osa Peninsula during the first week; the second week is spent in San Jose and in the Central Valley. Besides graduate students from educational psychology, this course and experience has attracted graduate students from social work, curriculum and instruction and health related departments. To requestion more information, CLICK HERE. Click Baylor Ed Psych in Costa Rica for more infomation about the course and to apply.